The following comes from LDS Daily. To see the full article, click here. Each week, members of The Church of Jesus Christ of Latter-day Saints partake of the sacrament, a sacred ordinance where bread and water are consumed as a symbol of Jesus Christ’s atoning sacrifice. The sacrament is also a time for those who have been baptized to renew their covenants, or promises, to follow Christ. While it is a wonderful blessing to be able to partake of the sacrament each week, such consistency also means the sacred can quickly become rote if we’re not careful. 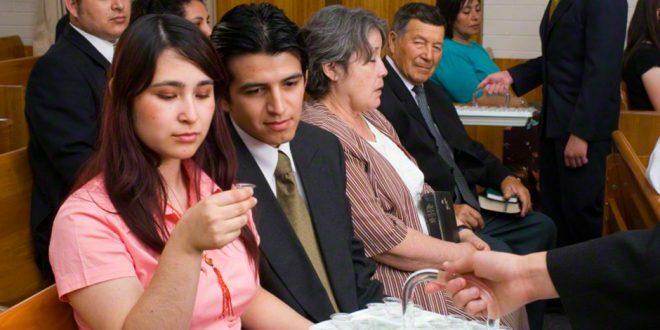 If you find your mind wandering or the sacrament spiritually unfulfilling, here are three simple things you can do to reconnect with the Savior through the sacrament. Are you willing to take the name of Christ upon yourself? How can you better keep the commandments? Did you remember Christ in the past week? If not, how can he become part of your life? How has the spirit been influencing your life? As we reflect deeply on our covenants as found in the sacrament prayer, we invite a more powerful spirit of inspiration and reverence into our lives. To see the full article on LDS Daily, click here.